Great work Boki! 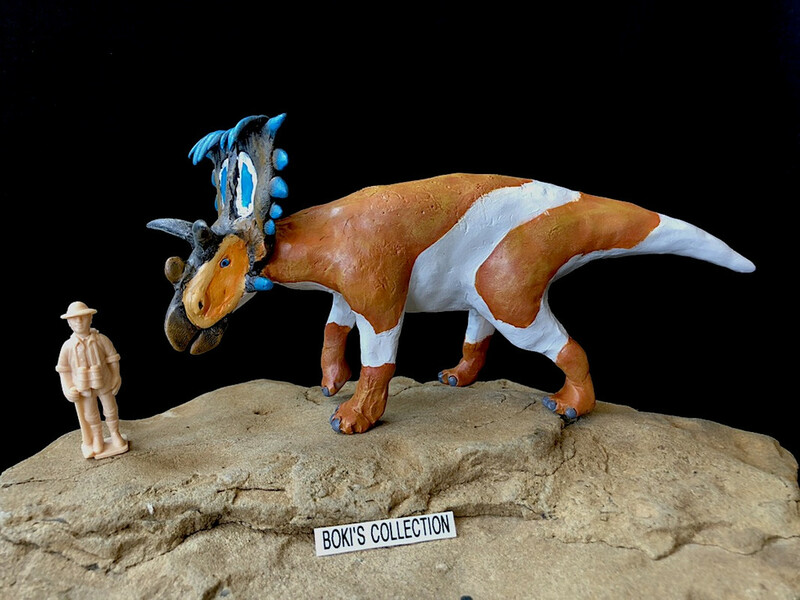 Very nice paintjobs again and I'm glad you saved the first Sivatherium, I like it's head sculpt a lot. Very awesome and inspiring! Keep up the good work! A heroic attempt of a challenging pose! 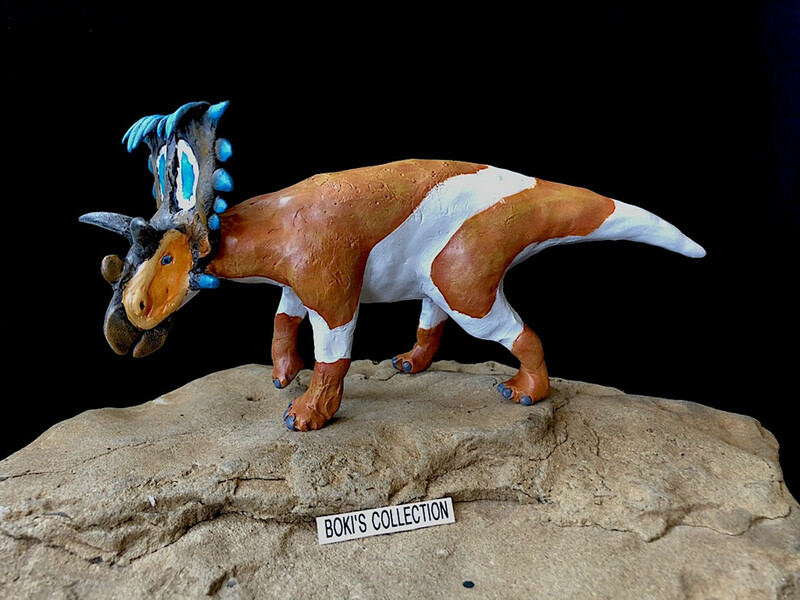 Well, I am now deep into sculpting dinosaurs! Haha, looking at my mammals, they are starting to look so left behind. 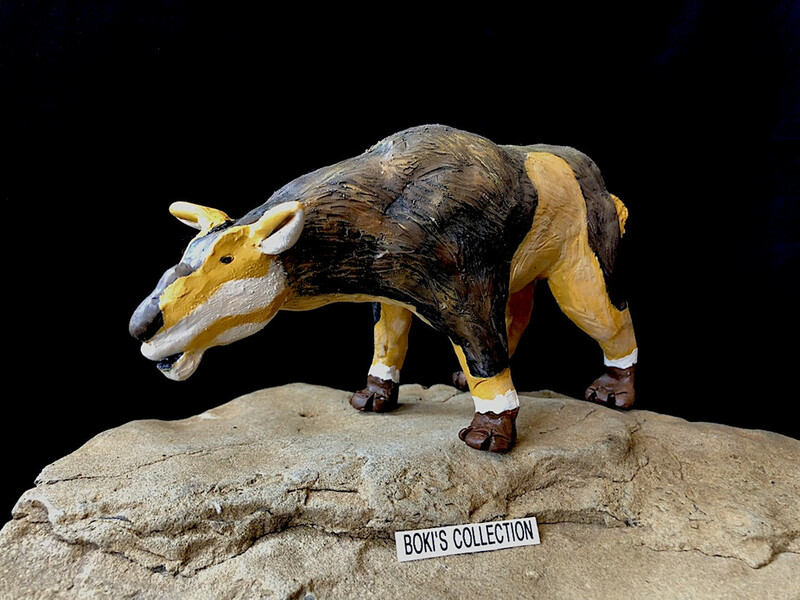 I am trying to finish up the last batch of mammals, mostly clean up and painting them now. So hopefully I can take photos of them and post them. 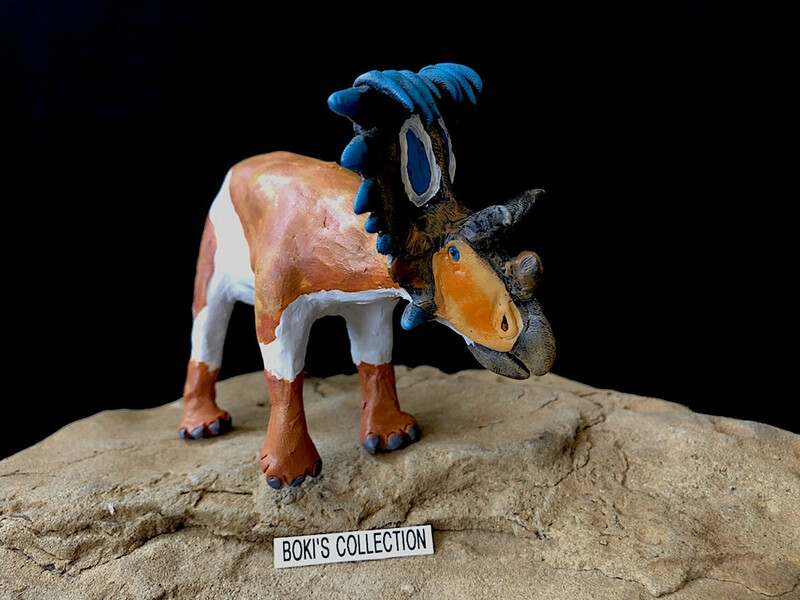 For now, I am working on a series of ceratopsians, yes, those lovely animals. 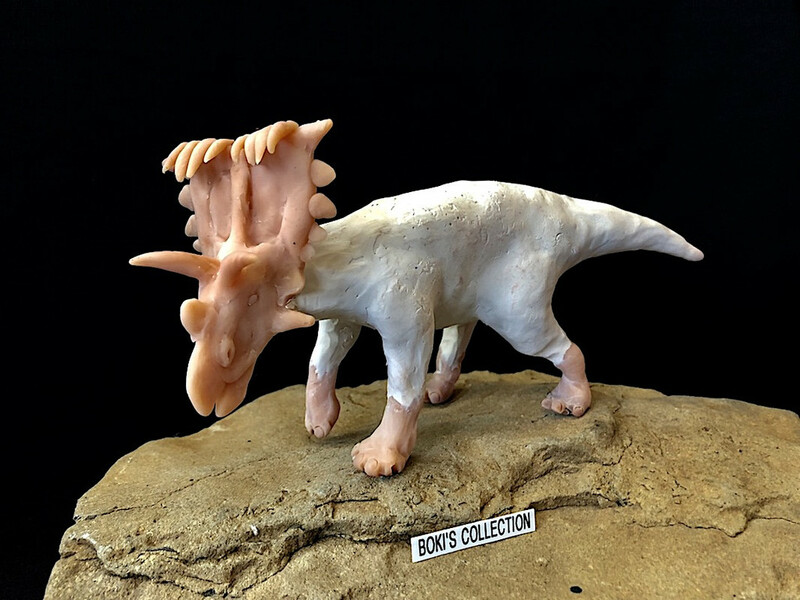 Ironically, as complicated and challenging as their head gear and horns are, I had better luck sculpting their heads than I had working on those sauropod heads. 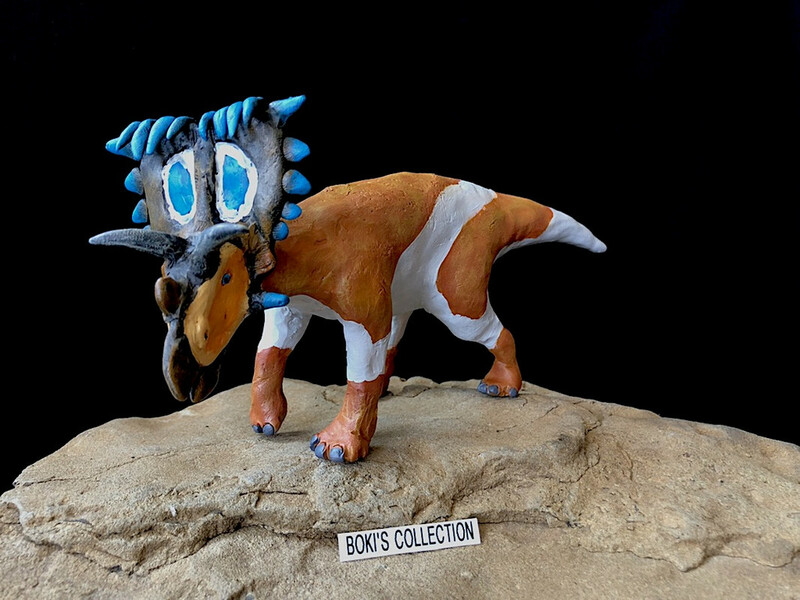 So, in two weeks, I have made 4 finished ceratopsians and two waiting for the body. I found it really hard to work smaller, I tried very hard to make the figures smaller, but my big hands and clumsiness is just not compatible with a smaller sized sculpt. You are very ambitious! I'm really looking forward to seeing the results. I am not so surprised the ceratopsian heads are easier than sauropods. They are bigger but also they have a very distinct shape. I think that must make an easier pattern to follow. Easier to know when you are getting it right, if you know what I mean. My guesses on identity: really not sure on the two outer creatures. 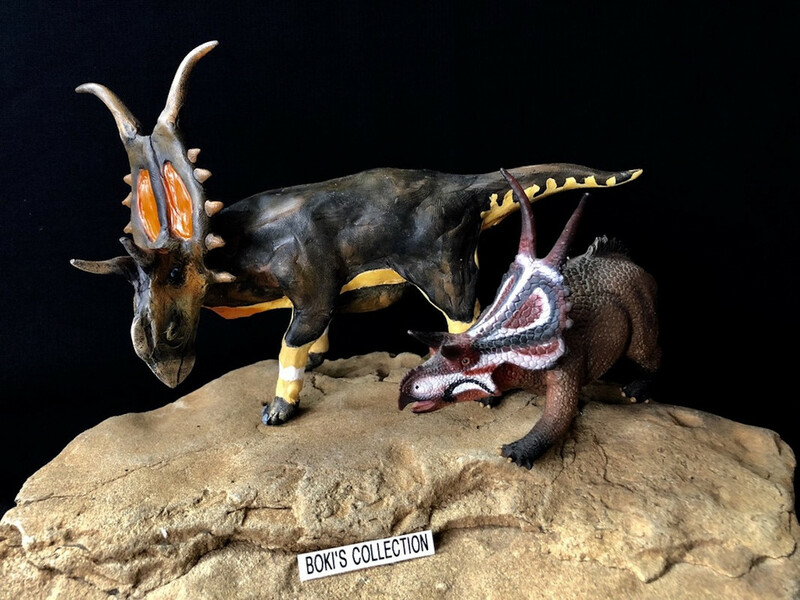 But the one in the middle with the crown-like edge to its frill, I think that is Regaliceratops. 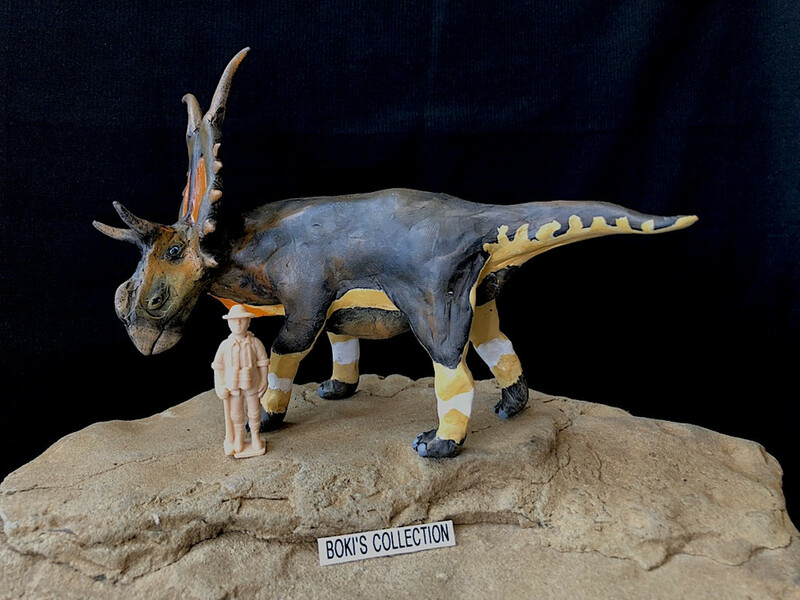 And I think the one with two upstanding horns to the right of it is Diabloceratops. 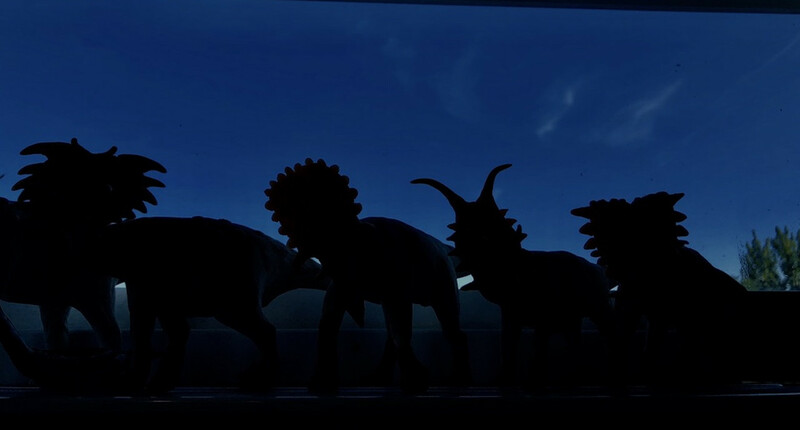 The one at the far right - I think its frill edging curls forward, which made me think of Kosmoceratops or Wendiceratops. But I'm not sure. And pass on the left-hand model! They look promising. 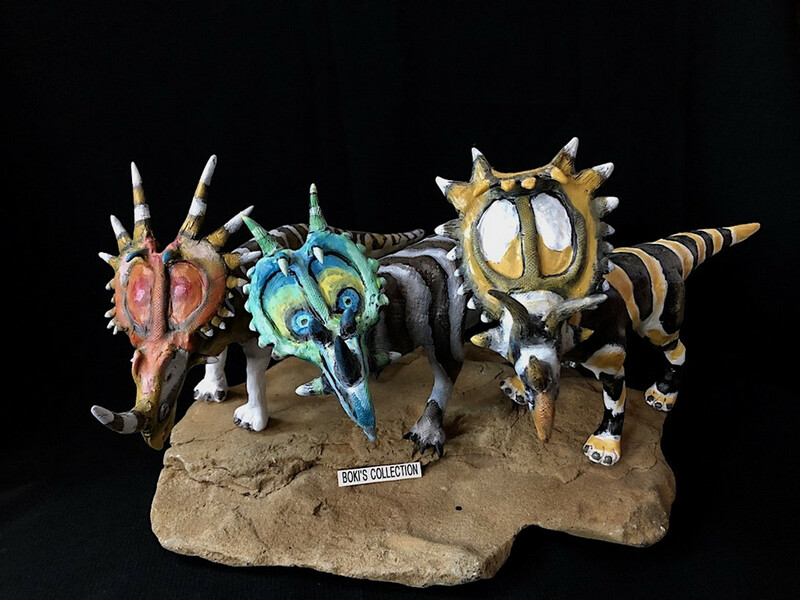 Vegaceratops on the right maybe, agree with ceratopsian on the middle ones and on the left I'll have to go with Indo-tops. 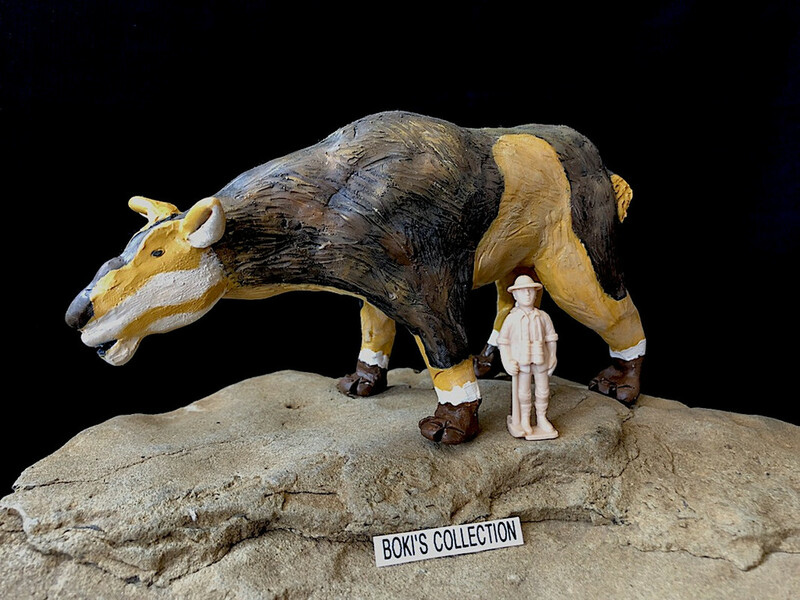 Thanks to Ceratopsian and Neosodon for their clues! I can't wait to see those! Four in one week!! - I wish that I was that focused! I still have the Triceratops I started ages ago sitting on my desk. Too many interests and outside commitments vying for too little time in my case. Looking forward to the unveiling. Well, I originally intended to post figures in order of when they are done... BUT, as I work on finishing them, I started to jump around, working on figures that I like the most and excited me the most. So they are all over the place now and not in order. With that, I decided that I will post each figures as they are completed, noting when they were finished in the process. 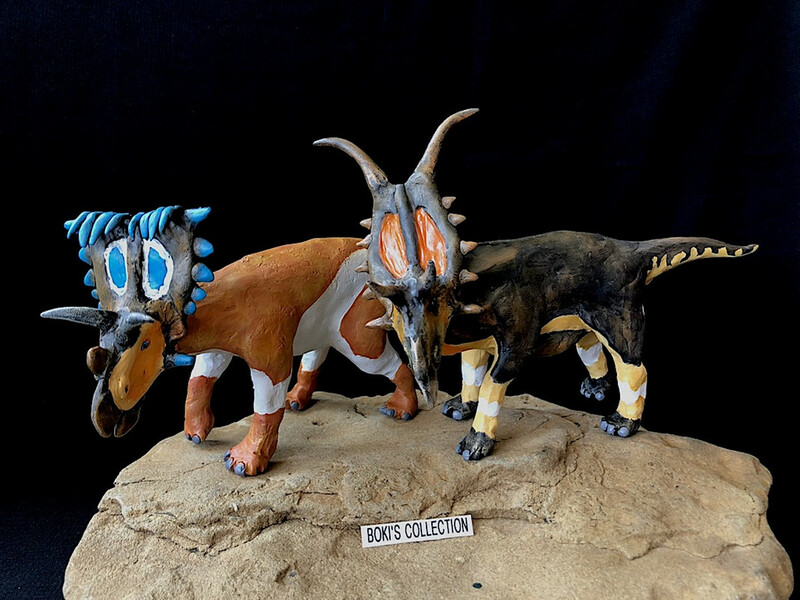 I decided that I will post the very first photo of my ceratopsians based on which ones were identified first, sounds good? Any more guesses? Tomorrow, I promise, I will post the first photos. Thanks again for looking and playing the guessing game! See you all tomorrow, cheers! 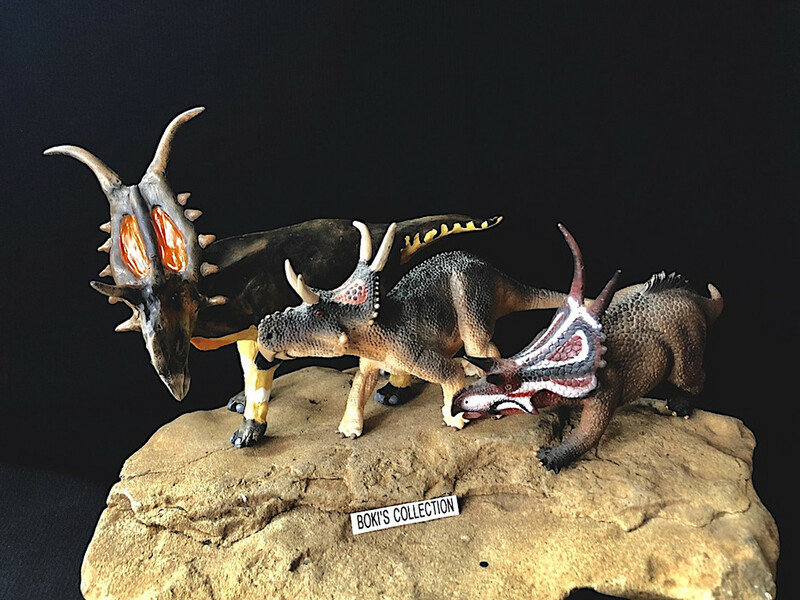 Okay, here we go with the first post of my newly finished ceratopsians. 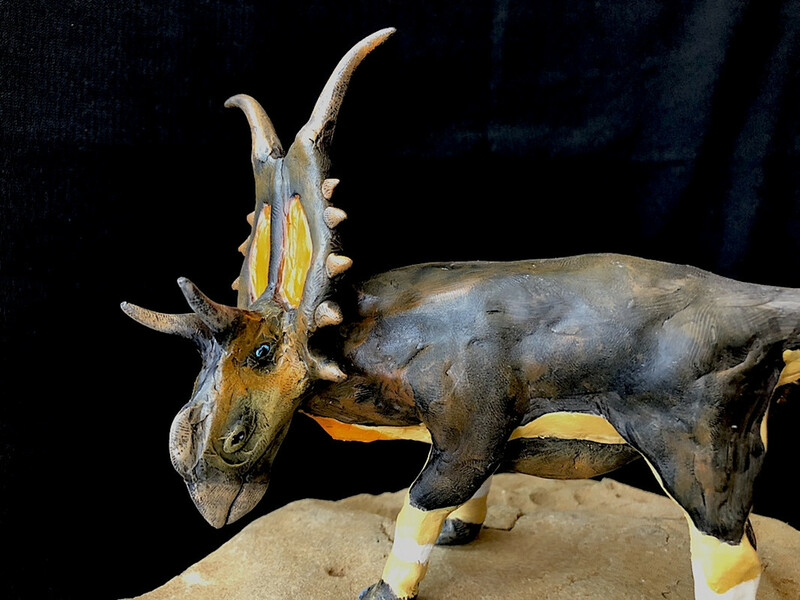 As correctly guessed, the two were Diabloceratops and Kosmoceratops I have always love the Diablo, so despite having two larger figures, I wanted to try my hands on sculpting one. 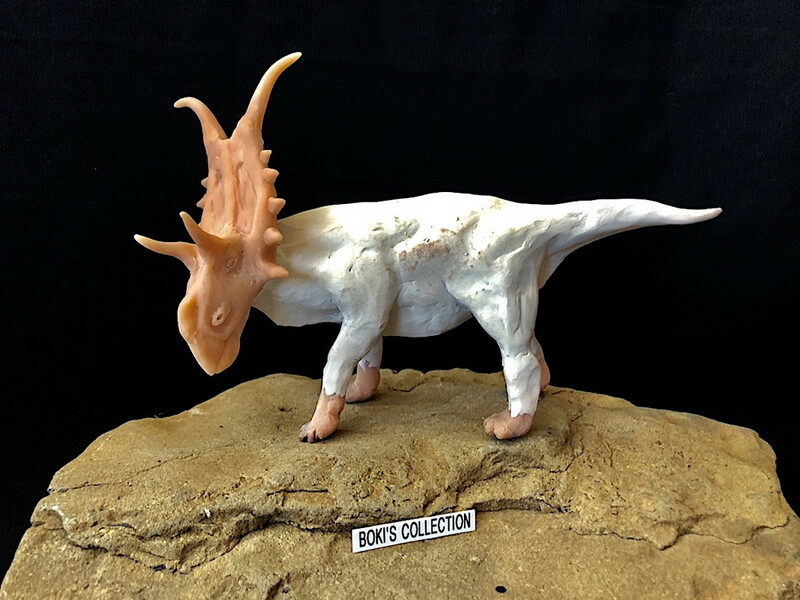 In the ceratopsian lineup, this is the 3rd figure I sculpted, there were two others ahead of it. As you can see, there are two different colored sculpey. The brown one is much harder but also retains so much details and much easier to sculpt small details. This is what I used for the heads and feet. 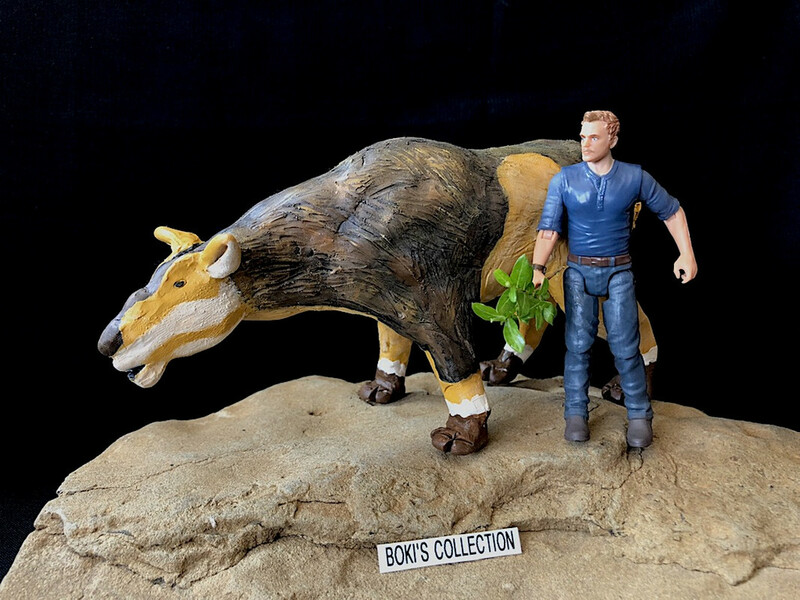 I wanted to show it with the Safari and CollectA versions just to give a better idea of the size and also to show the herd. Overall, I am very happy with this figure turned out. Of course there are flaws, but that's fine by me. One fun fact, if you look at the head, you will see a lot of small line. This turned out to be my fingerprints! Hahaha! I dry-brushed the figure to give it more texture and to also bring out as much fine details that there is. Dry-brushing really helps make a repainted figure much more dimensional and really brings out details that are otherwise lost if you just paint it in one coating. The painting process is the longest stage since you have to wait for the first undercoat of paint to dry before you can add another one. But I really love painting, so it was fun once I can start with the design part of it. I went with a simple design and color scheme for this guy, mainly I was inspired by the Asiatic Gaur, a huge cattle from Asia for the colors. Well, hope you guys like it. 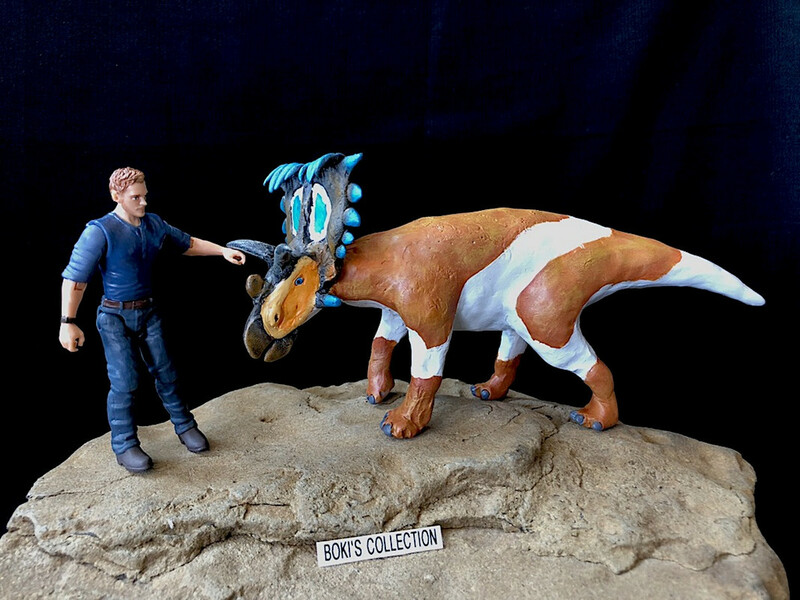 If you are curious, it took me 1.5 hours to sculpt the head, and the same amount of time to sculpt the body. Tomorrow, I will reveal the next species that was correctly guessed, so hope you guys stay tuned. Cheers, and t hanks for looking! Very nice! I like the color on its face, it's blended nicely. Looking forward to the Kosmo and to get to know what are the unidentified ones! Okay, the finally the last of the two that was correctly guessed. 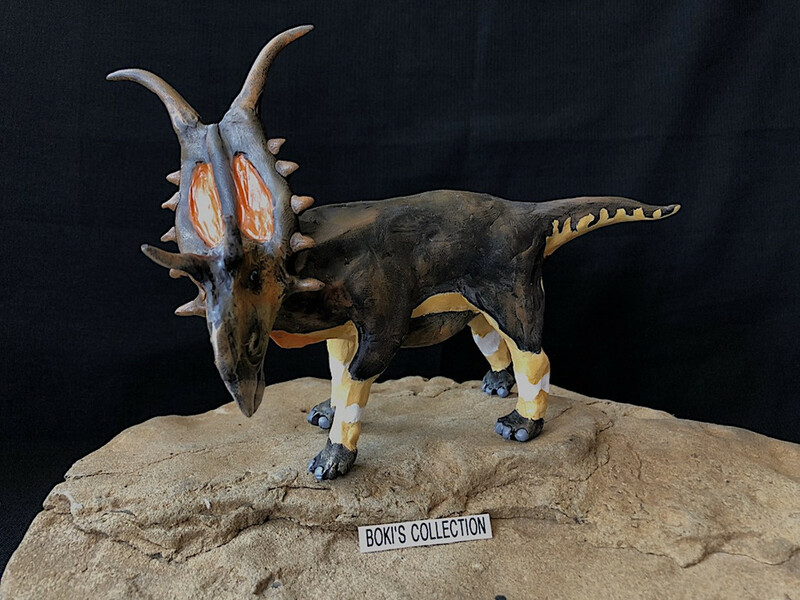 It's the Kosmoceratops, another favorite of mine. When I was in the process of deciding which colors to use, I wanted something that is unexpected a nd very different from what I have done in my past repaints. I love the color blue, and I figured this would be a good choice to use it on. I'm taking a break all next week, so there won't be any updates unless I get a break. You should be pleased to have created such individual creatures. 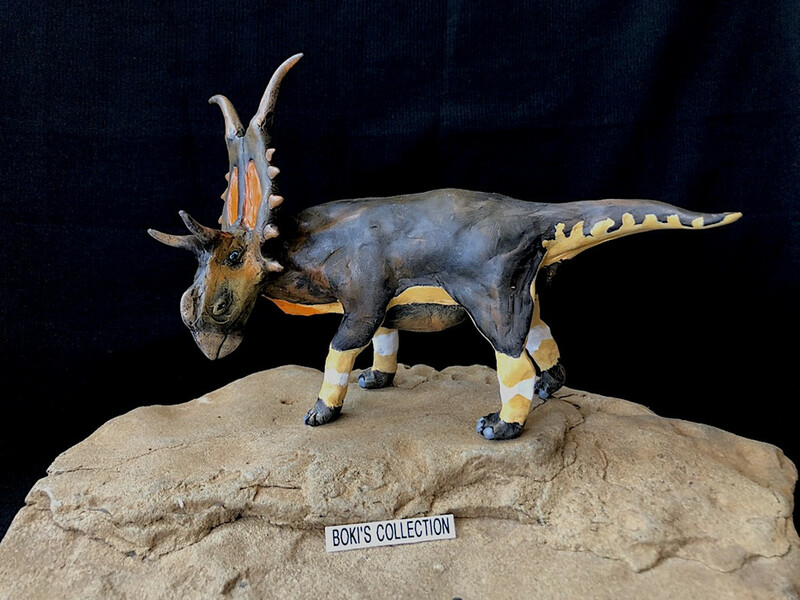 I think the brilliant colours of the Kosmoceratops work well. As you said, your style is quite stylised. The strong colour blocks and contrasts fit well with that look. And they remind me of the hot summer we are having here! 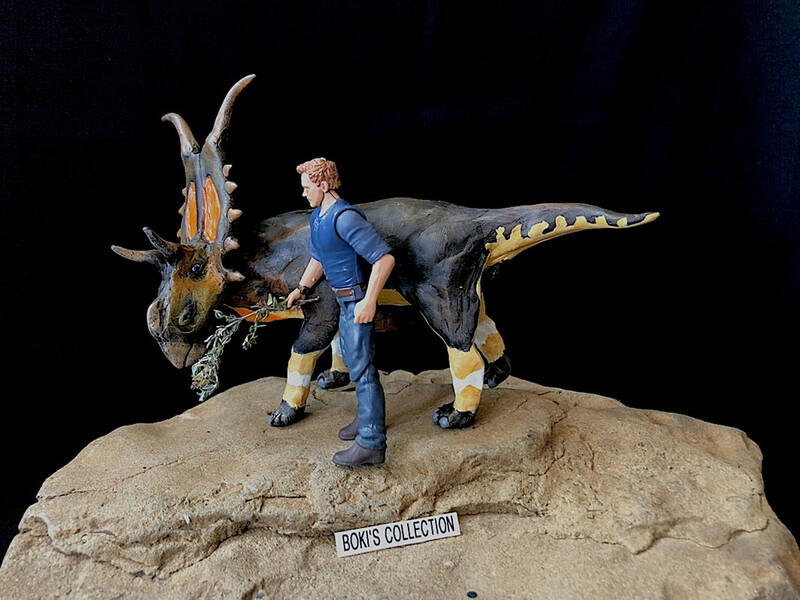 That's great, I love the use of the blue, I know some people don't like those colors on Dinosaurs but applied in a good way they can make for an interesting look. You nailed it in my opinion. It looks great with the black on the frill and the blue eyes look good too. I actually like the color palette. It screams sexual selection, which seems to have been so rampant in this lineage. Thanks everyone. 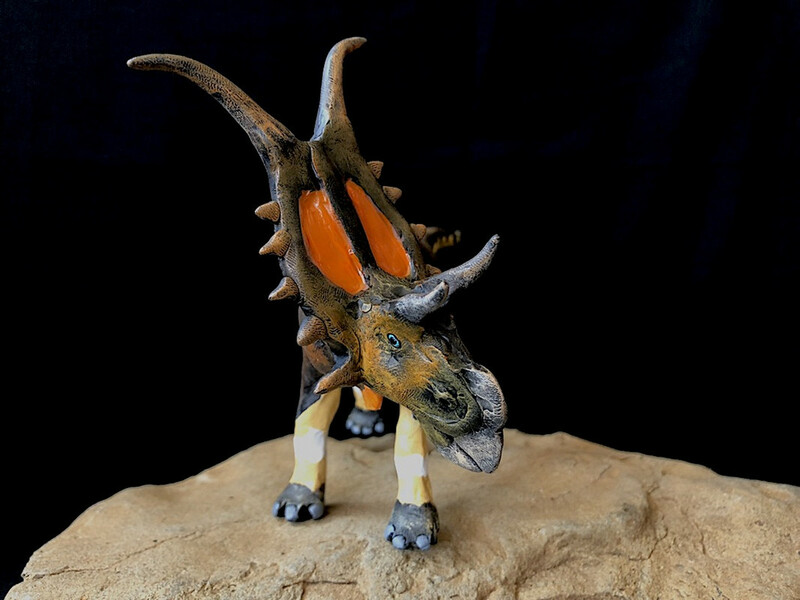 The ceratopsian herd keeps on growing, there are now a totally of 10 ceratopsians ! Anyway, I have a new mammal to show, this time we head down south to South America . 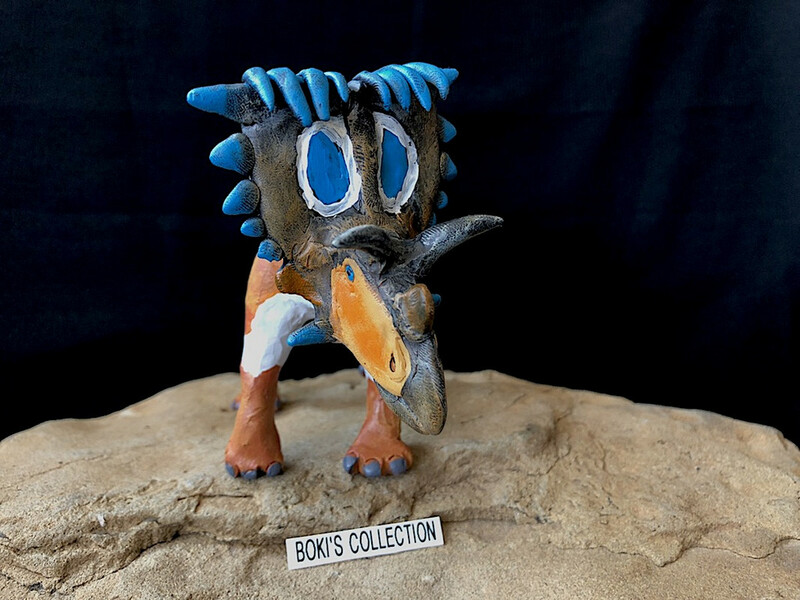 Meet Toxodon! I was fasciated but his large animal and really enjoyed it's very short cameo in one of the those prehistoric park show. 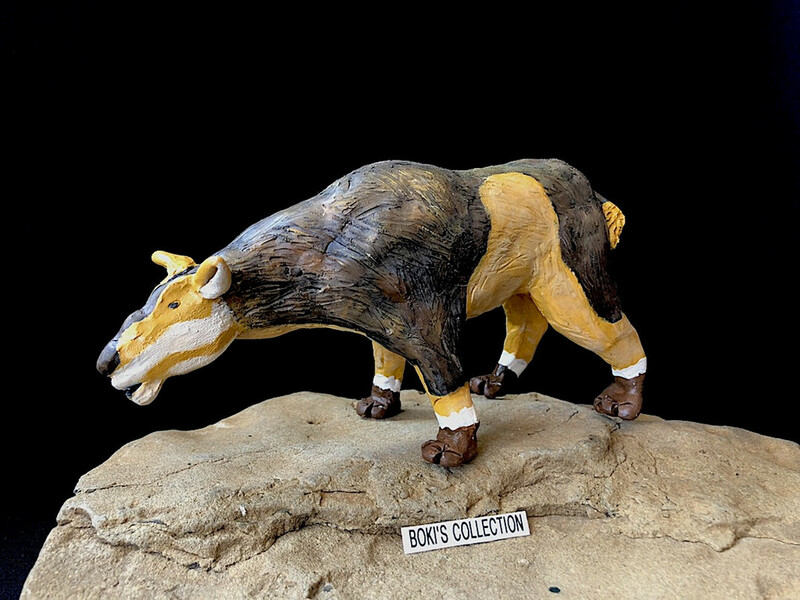 This figure was sculpted just after the Sivatheriums, there is one other mammal just ahead of it that I will post next. Well, hope you like her, I sure had a lot of fun sculpting this one. Till next time, Cheers, and thanks for looking! Fantastic work (rather enjoyment!) I love your color choices. 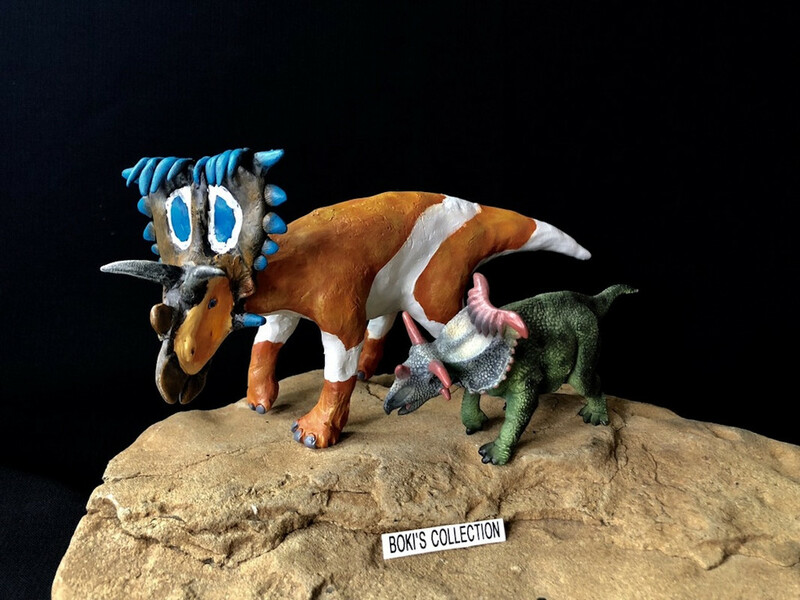 Gastornis, Kelenkken, Diatryma and Dinornis are my personal favorites! 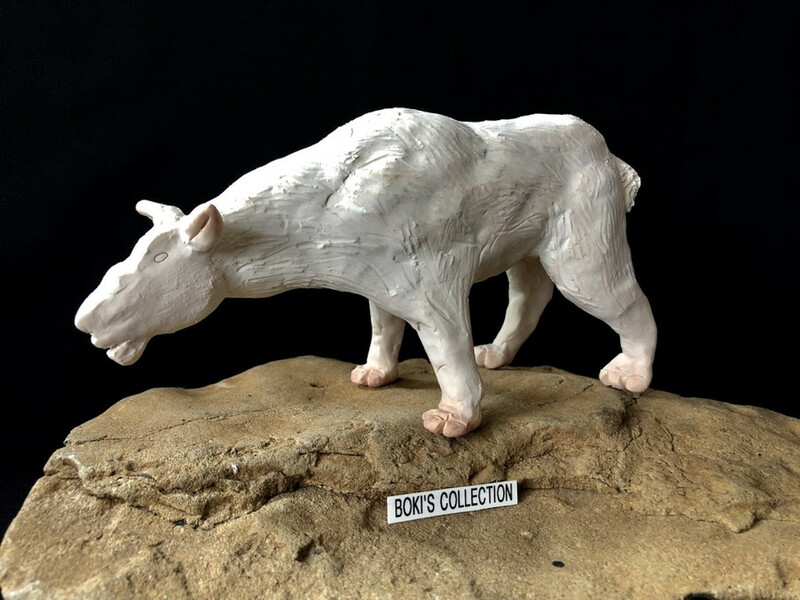 Keep up the great sculpting and painting!